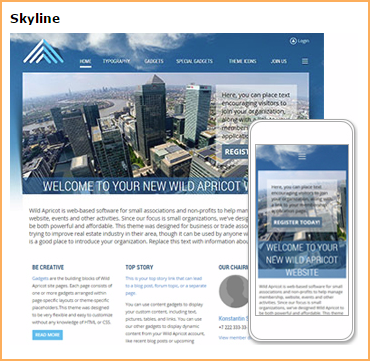 Wild Apricot is committed to delivering a positive mobile experience for both site administrators and site visitors. 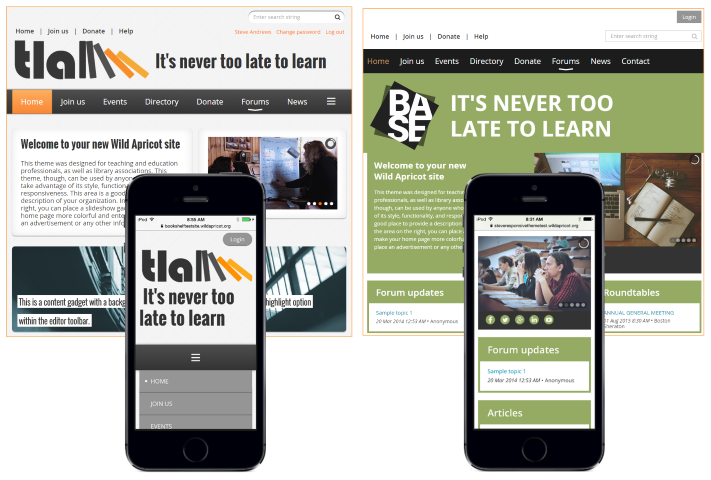 Responsive website themes allow administrators to design mobile-friendly sites that automatically scale their contents to fit properly on different sized screens, allowing your members to perform self-service functions such as registering for events and paying invoices on the go from their mobile devices. Wild Apricot's mobile app for admins – available for both iOS and Android devices – allows administrators to manage contacts and events from their phone or tablet. The Wild Apricot for members app allows members and other contacts to log in and view content drawn from your Wild Apricot site. Wild Apricot offers a number of responsive website themes. Themes that are responsive will appear on the Themes screen with both desktop and mobile thumbnails. A site designed using a responsive theme automatically adjusts its layout and appearance according to the width of the screen used to view it. Gadgets will be stacked within a single column and resized. Image sizes and font sizes will also be adjusted. A mobile version of the site menu will be displayed, with a limit of 3 levels in total (main menu plus 2 submenu levels). Only horizontal menus are available for responsive themes. For more responsive design tips, see Designing responsive pages. Making your existing Wild Apricot site responsive can be as simple as switching to a responsive website theme. When you switch to a different theme, permanent changes are made to your web pages. As well, a different set of master layouts and page templates becomes available as the basis for individual site pages. As a result, layouts and gadgets may change position within your pages. Also, all theme overrides and any customizations made on the Colors and styles screen will be discarded. Switching back to the previous theme may not restore your site to its previous appearance. You should consider asking Wild Apricot Support to create a clone of your current site so you can test your changes – though you'll have to apply your changes separately to your live site, since the clone site functions as a sandbox and cannot be copied in place of your live site. To change your website theme, select the Theme option under the Website menu. Within the theme gallery that appears, click the theme you want to use then click the Apply selected theme button. After you click Apply selected theme, you will be asked to confirm your selection before the change is applied. Then, you will be taken to a site page where the selected theme can be previewed. From here, you can make the change permanent or revert back to your previous website theme. After switching to a different theme, you should review your entire site to make sure the new settings work well with your content, and make whatever adjustments are required. One or more pages may be added to your site to illustrate various theme-specific content and styles. With a mobile-friendly site in place, your members can perform self-service functions from their phone or tablet without zooming or excessive scrolling. Applying for membership from a device on a responsive site is the same as on a desktop computer. If there are multiple membership levels, the applicant begins by selecting the appropriate level. After the applicant enters their contact details and submits the application, the new record is automatically added into your database and a number of automatic actions take place. Among other actions, an application invoice is generated, and password and application initiation emails are sent. For more information, see Membership application form. From a responsive Wild Apricot site, members and non-members can view, register, and pay for events using their smartphones or tablets. First, they choose the appropriate registration type, then complete the registration form, choosing any optional extras and registering guests (if enabled). Once they submit the form, an event record is created and they will be prompted to confirm the transaction. After clicking the Confirm button, the registrant is taken to the Invoices and payment tab to complete the payment. If the registrant is not currently in your database, a new contact record will be added and an email will be automatically sent to them with their password and login information. For more information, see Self-service online event registration process. From the Invoices and payments screen on their member profile, members can view and pay outstanding invoices from their mobile device. Members can select one or more outstanding invoices then click the Pay online button to make the payment. They can also select and apply any unused account credits to the net amount. The Wild Apricot app – available for iOS and Android devices – allows Wild Apricot account administrators, or administrators with both membership and event access rights, to perform a number of administrative functions. For the full range of Wild Apricot functionality, including the ability to design site pages, administrators can log into their Wild Apricot account from a browser. The browser version of Wild Apricot can be accessed from mobile devices, but not all functions are supported. For example, you can add contacts, manage events, and manage invoices. You cannot, however, modify site pages or compose emails. For more information, see Wild Apricot for admins app for IOS and Android. For ideas of ways to use the app, click here. Before your members can use the app, you must enable it within your Wild Apricot settings. To enable the member app and control other member app settings, hover over the Settings menu and click the Member app settings option. For more information, see Wild Apricot for members app for IOS and Android.